Summer is here and with it BBQ season. And yes you can still enjoy it as much even if you have food restrictions. 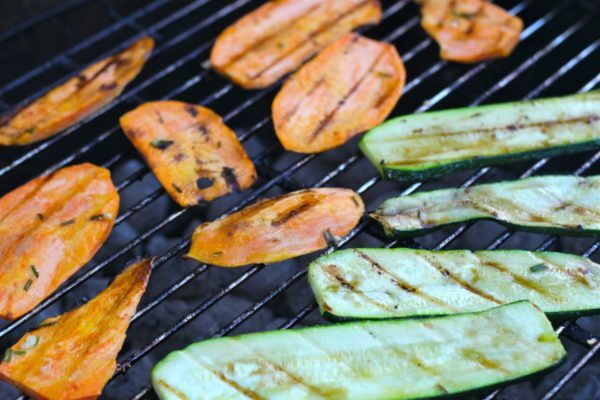 These super delicious grilled sweet potatoes and zucchini are great for everyone, from the gluten and dairy free peeps to the Paleo and AIP folks. But you don’t need to have food restrictions to enjoy this recipe. I can promise you that everyone is going to want some of these bad boys. I looooove BBQ season, but seriously, who doesn’t? In Germany, where I grew up, it is a huge part of the culture as well, but we call it grilling. There are naturally more salads and veggies involved in a traditional german BBQ, besides meats and sausages of course. Grilled zucchini is a very common staple in Germany, so if you are not used to that yet, give it a try, it is so so delicious. My parents backyard is full of homegrown veggies and fruits. We have always used massive zucchinis from the garden for our family BBQ. Sweet potatoes are a newer edition due to my sensitivity to nightshade vegetables; and what a delicious discovery this was! Sometimes you find amazing things when you are forced to look for new food options and this is one of those examples. This recipe is super easy to make. Simply cut as many sweet potatoes and zucchini into 1/4 – 1/2 inch slices. Cut them lengthwise in order to get larger slices. To marinade place them in a large casserole. Add olive oil, salt and pepper and minced garlic (garlic powder works as well) to every layer, and then add the next layer on top. You can make this ahead of time and store it in the fridge. Once the grill is hot place the veggies on there using tongs and cover the grill with its lid. That way they cook through quite fast. Grilling time will vary depending on size and heat. They should be done after approximately 2 minutes on each side or once grill marks appear and the inside is tender. The sweet potatoes might take a little longer. When using olive oil for higher heat cooking, it is very important to opt for a high quality product. Choosing extra virgin olive oil in a dark glass bottle stored in a cool dark place will do the trick. 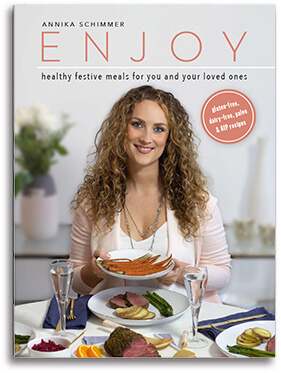 To read more about why this is important and a few more tips to get the best quality olive oil check out this article written by Dr Sarah Ballantyne. 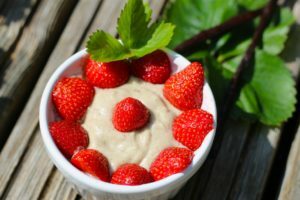 Don’t forget to try my dairy free yogurt and herb dip. It is the perfect addition to the grilled sweet potatoes and zucchini and you don’t want to miss it at your BBQ. These grilled sweet potatoes and zucchini are a must have for your next BBQ. The recipe is very easy and quick to make and it is gluten free, dairy free, Paleo and AIP friendly. 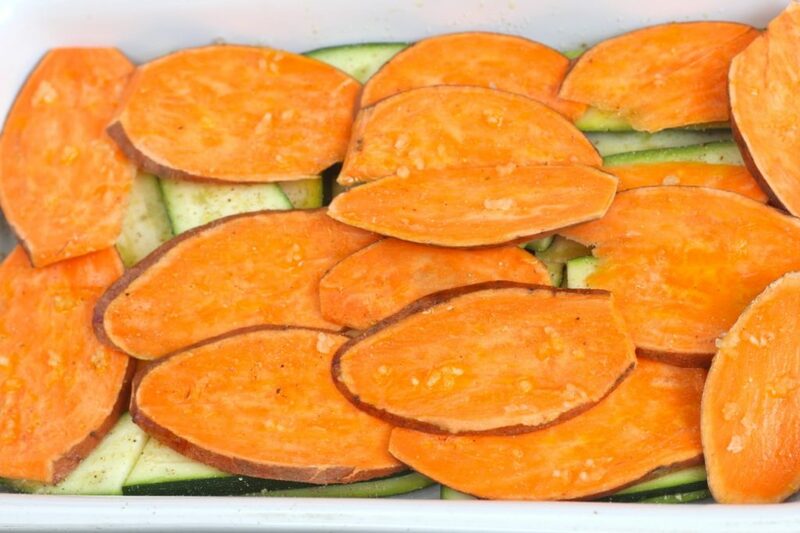 Wash and cut sweet potatoes and zucchini into 1/4 - 1/2 inch slices. Cut them lengthwise in order to get larger slices. I would recommend to cut the sweet potatoes less thick in order to cook through faster. To marinade place them in a large casserole. Add olive oil, salt and pepper and minced garlic to every layer, and then add the next layer on top. Once the grill is hot place the veggies on there using tongs and cover the grill with its lid. Grilling time will vary depending on size and heat. They should be done after approximately 2 minutes on each side or once grill marks appear and the inside is tender. The sweet potatoes might take a little longer. You can marinade the sweet potatoes and zucchini ahead of time and store them in the fridge.